Today is the first official trading day for Gold Futures in Thailand. It is expected to draw much attention even global prices are in fluctuation. It is best advise for low and fixed income to avoid this particular gold futures trading without studying the market environment well. Basically it is high risks! Gold is the fourth product of Thailand Futures Exchange, the country's non-agricultural derivative bourse - which began trading in April 2006 - after SET50 Index Futures, SET50 Index Option, and Stock Futures. Customers buying gold in Thailand have changed their investment preferences with gold bars comprising around 80 per cent and ornaments around 20 percent of total purchase. Earlier, gold bars made up 5 percent and ornaments 95percent. If investing in bars becomes more popular, many believe gold futures would also be another popular alternative investment. 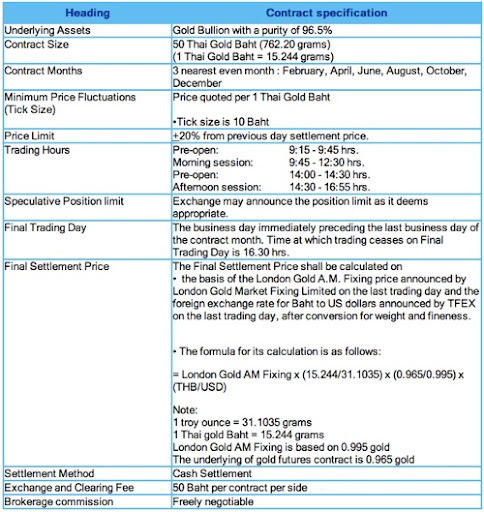 Inestors could trade the gold futures in TFEX at 50 Baht weight per contract or Baht 750,00 (for gold price at Baht 15,000 per Baht). The initial margin that they need to deposit is Baht 66,500 per contract and the maintenance margin is Baht 46,550 per contract. The commission fee for gold futures trading was set by the Futures Industry Club as a sliding scale. If customers trade gold futures not higher than five contracts per day, they would have to pay Baht 500 per contract, six to 20 contracts for Baht 400 per contract, and Baht 300 per contract for the 21st contract onward. Customer would earn from "Differences" between Buying and Selling price and only need deposit of around 1/10th of the actual price. This practice made the market become very attractive, but I would like to warn you that, this is Rich People game, not easy one, as it is very high risks!